Sean Maguire admitted scoring a 94th-minute winner as Preston North End saw off Birmingham was a “special moment”. 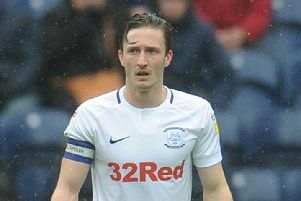 The Irishman popped up to head home Daniel Johnson’s corner to settle a game low on quality and spark wild scenes of celebration at Deepdale. The dramatic 1-0 victory moved the Lilywhites up to seventh with their fine 12-game unbeaten run meaning they only sit outside the play-off places on goal difference. “It was a strange game,” Maguire said. “We knew that there wasn’t going to be much football played. “They just sit in and make it hard for you, especially with the conditions. The wind and rain were horrible. “We knew it was going to be a day where it was going to be one chance to win the game. “To do it in the last minute in front of a lot of Preston fans was a special moment for me. PNE’s chance looked to have gone when Johnson was denied by Lee Camp one-on-one at the death. But the midfielder picked himself up and sent over the resulting set piece and Maguire did the rest for his third of the season. “DJ probably should have scored and he’ll know that himself,” the striker said. “He redeemed himself and got the assist for my goal though. “It was just one of those where the guy picking me up maybe didn’t expect me to beat someone in the air because of my size. It was largely a game for defenders though, Maguire praising captain for the day Ben Davies and Jordan Storey. “I thought the four guys at the back did very well,” he said. “Especially Jordan and Ben, they’ve really come on over the last couple of months and have a serious partnership now. “They keep it solid at the back and then you know when they get the ball they’re always looking to play. “Having two centre halves who love to play football is a massive plus.